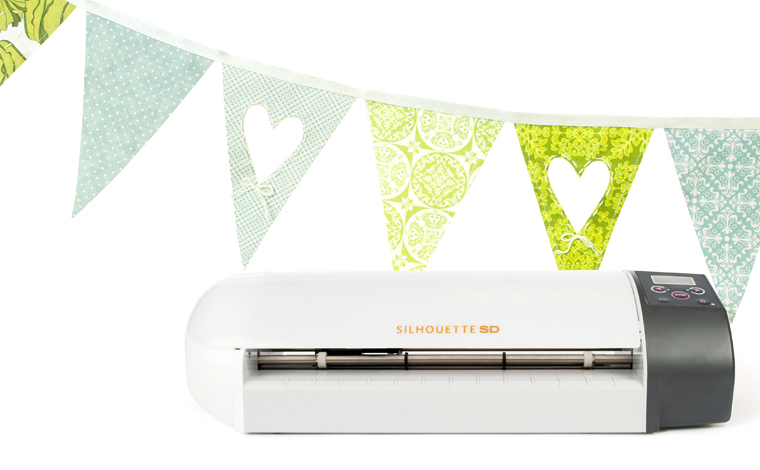 New Silhouette Product - Fabric Interfacing! I know it's possible to cut fabric on the Silhouette. I've seen how-to posts in the blog world, but I still haven't tried it. 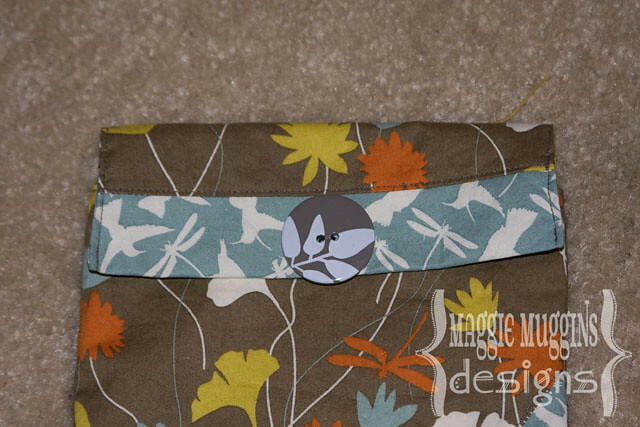 They've just added Fabric Interfacing to their product line so when I do cut fabric I will know exactly what to do. Can you imagine all the possibilities? It looks like so much fun! There is a video about the product available on the blog Infarrantly Creative. Head on over there to watch the video. There's also a discount code for 30% off your entire purchase on SilhouetteAmerica.com which is a better discount than Silhouette's own right now. For those of you wishing you had a Silhouette it would be a good deal - I'd suggest blatant hints to your significant other. For example: a picture of a Silhouette, with a note attached, saying: "I want this for Valentines Day. You can save 30% this week!" posted on their mirror might work! Alright, in reality, I understand many of you are saving what little extra cash you have for this,In which case, I highly recommend purchasing it from Amazon.com . It is $100 less there and while you may not get the same package the extras are not essential to begin enjoying this awesome machine! 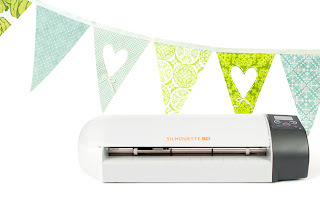 Thanks to Janet for leaving me a comment about Cricut Imagine's Printable Vinyl . She suggested it for use with the Spice Jars. I'm definitely going to try this out. So anyone who's considering this project - let me know if you try the it and how that goes. I'll of course, let you know too. I've got all sorts of ideas for it already. But I will look for some that is 8.5x11"! Hope you're all having fun and possibly getting a little crafting done. This picture was taken in haste. I took one bite, then realized I hadn't taken a picture. So I did. 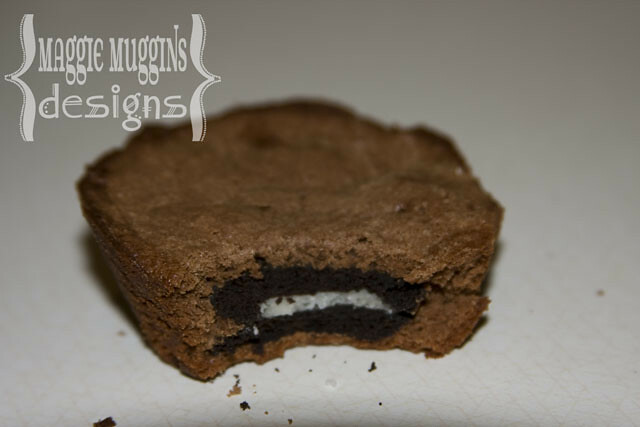 I took it as quickly as possible because I so wanted to finish the whole Brownie Oreo off. My son loved helping with this one, getting his little fingers all covered in Brownie Mix and then having to lick them off. I'm thinking I'll be making a bunch of these for Valentines. I'm considering using a Heart shaped Muffin Pan and dipping them in Red Candy Melts . Want to try the recipe out for yourself? 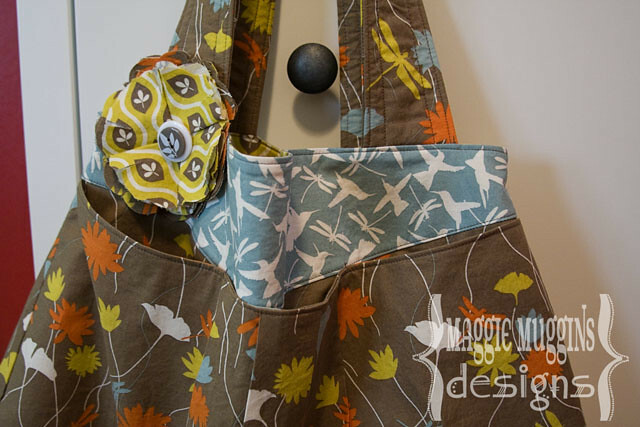 You can find the instructions - and way cuter photos over on the blog Picky Palate. Thanks Jenny for a fun new recipe! I showed you all my favorite new Spice Drawer just last week. 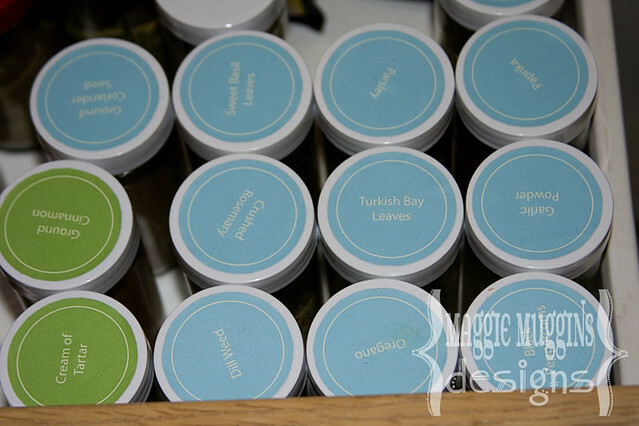 Of course, I know some of you might want to do this too so I've prepared the files that I used for my Spice Jars to share with you! You can download either the Silhouette version or the PDF file. The Silhouette file you can edit. the PDF I tried to put common spices on, but let me know if you have requests. I'll see what I can do. 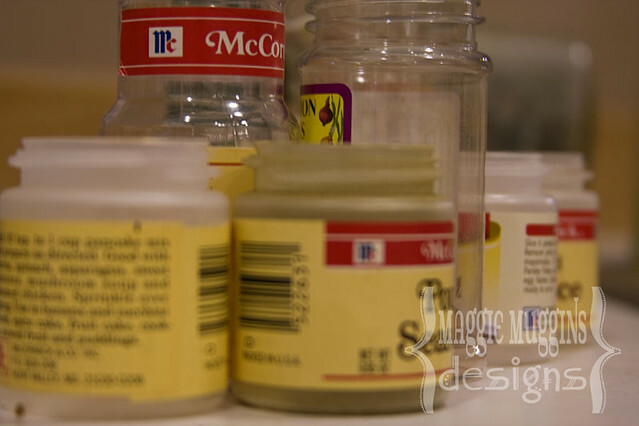 I used these Spice Jars . I actually bought a second set after getting the first one finished. 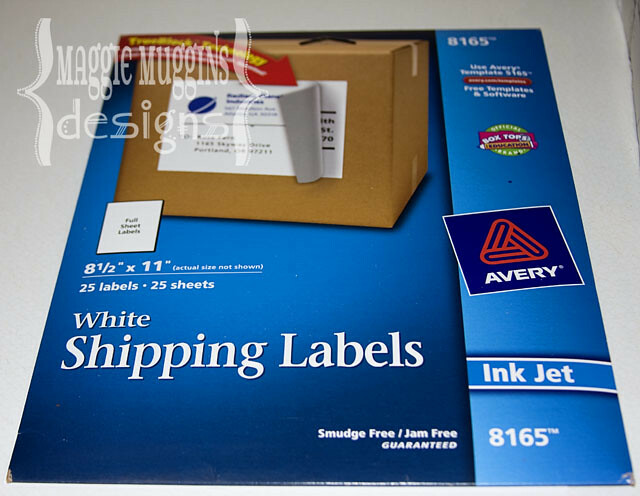 Then I got White Shipping Labels by Avery (8165) . 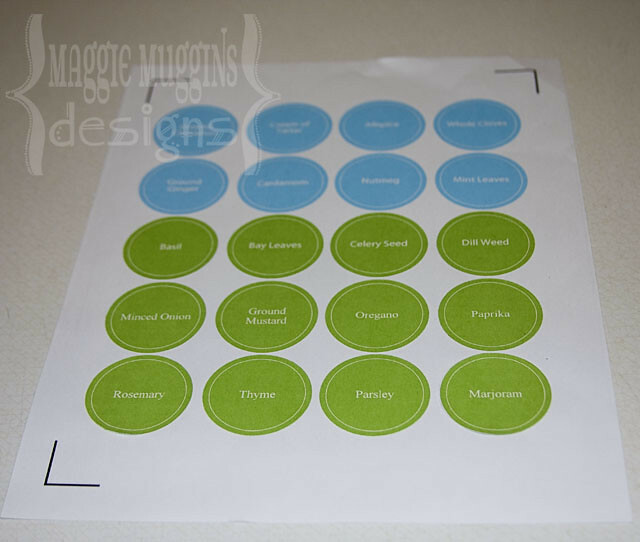 Basically, it's a full sticker sheet you can print on. I printed the file with Registration Marks. Then cut it on the Silhouette (Speed 8, Thickness 12 - I should have used 13). *Edited to Add: I cut this paper again with the Yellow Tip, No Mat, Speed 8, Thickness 13 and it was perfect! Then you place the stickers on the lids. Lining them up was not too difficult. I wasn't perfect, but it still looks pretty good. I would highly recommend some sort of top seal (Mod Podge or something similar) to protect the labels from damage. A tiny splash of water is enough to leave a mark. Remember, if you edit the text in the Silhouette file to re-align the text to the center of the circle. 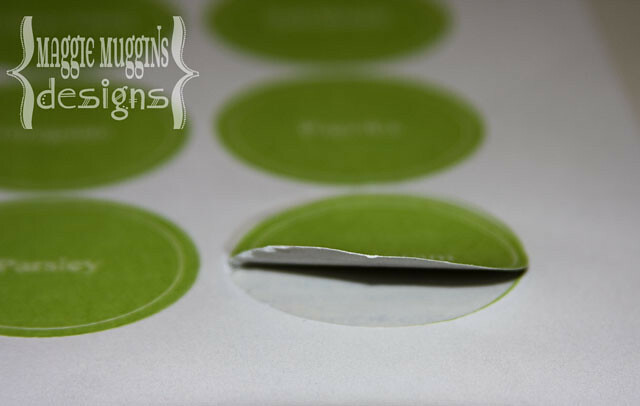 This is already set up to cut only the outer circle, but I would confirm that is what it will do before cutting. 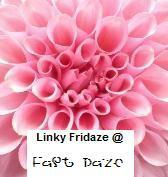 The font I used on these was Myriad Pro and must be installed for use with the Silhouette. Either that or use your own font. As with all my free shared files, these are for Personal Use Only. 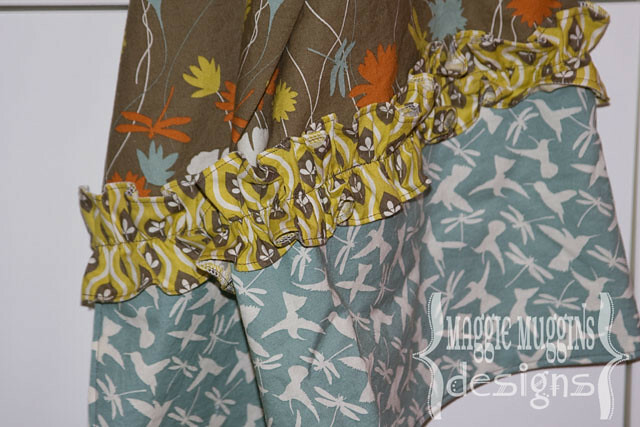 Please share photos of your projects made from these files in my Flickr Pool Maggie Muggins Designs In Action. Recently, as in a few months ago now, my close friend had a baby boy. 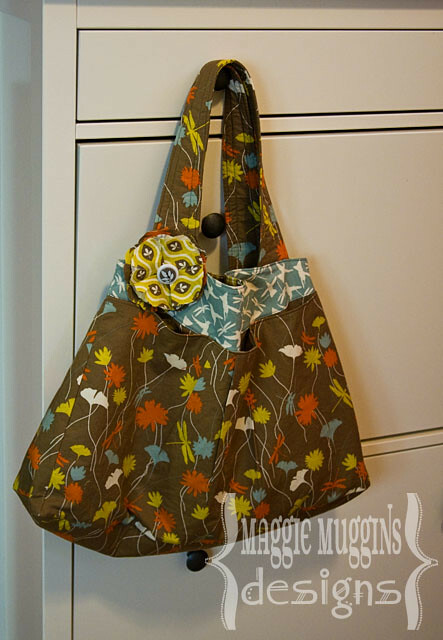 Of course, I couldn't help but make her a diaper bag, and when I purchased extra fabric by mistake, I made a nursing cover and a diaper tote too! 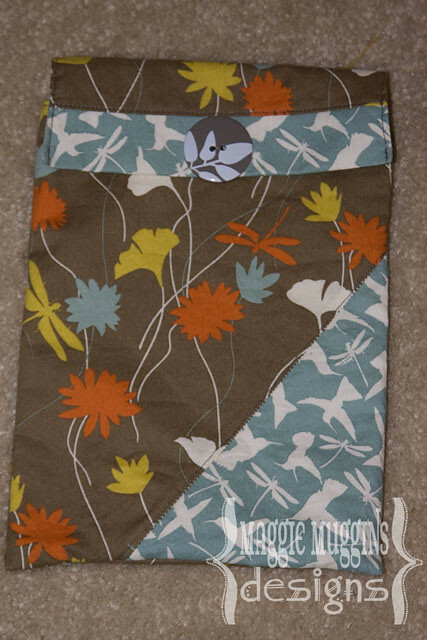 I couldn't help it, not only was I in a sewing mood, but I was really enjoying cutting and sewing such beautiful fabric. 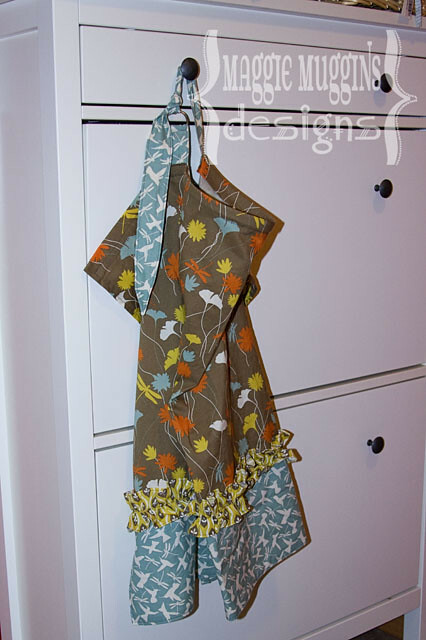 This fabric is from the Arcadia collection by Sanae for Moda. Not only are the colors fantastic, but it's a very nice soft cotton! 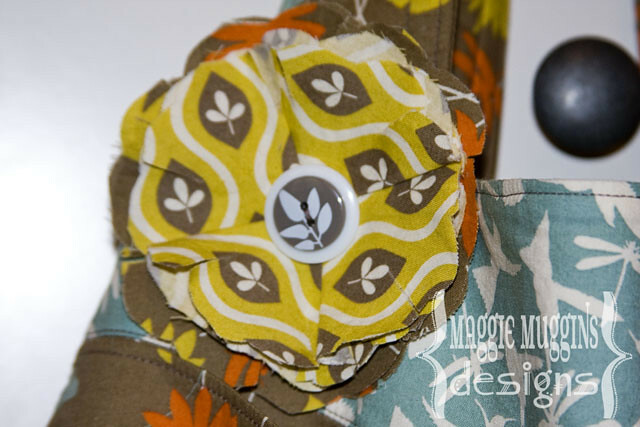 I love the large deep hidden pockets on the outside and the fun detail of the flower. I couldn't believe it when I found this set of buttons at Joann's that goes so well! I didn't even have the fabric with me to make sure! 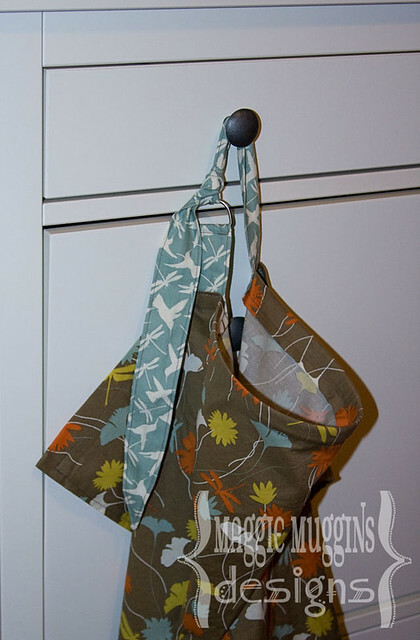 I've had questions about the pattern and currently am preparing it for a friend of mine to test. I followed a simple pattern that I have for Nursing Covers, but added my own flair. The bottom third I added a contrast fabric and then covered the seam with a ruffle of the third contrast. The ruffle was 1.5 times the width and I made it 2.5 inches wide, before hemming it. Really simple. Somehow I missed one of the D-Rings when I was sewing them on. I think I actually like it better that way though. You can tie it in a knot and have it exactly the length you want it and not worry about it slipping! 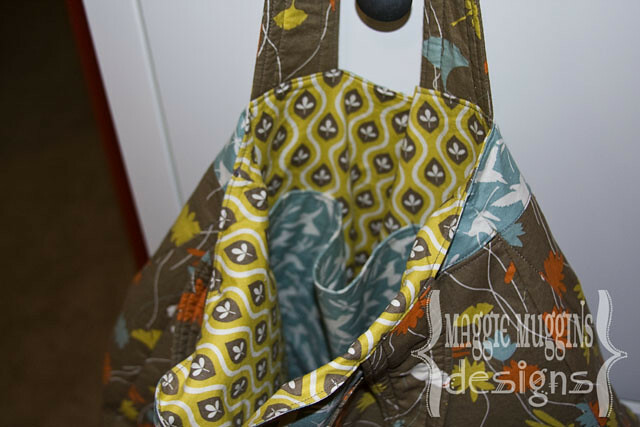 The Tote I used a tutorial online for, but again added my own look to it by adding the contrast fabric and button. It is actually velcro, but I put the button on it for show. 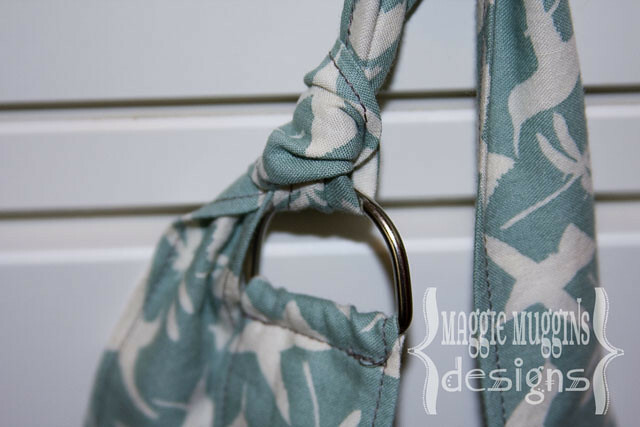 Linking up to Get Your Craft On with Today's Creative Blog. When we moved into this house I arranged the kitchen in a hurry. We had a brand new baby at the time. Since then I have gone through and organized and reorganized. Somehow, though, I can never seem to organize my spices just right. I've tried tubs, just left them on the shelves, basically everything that didn't work. 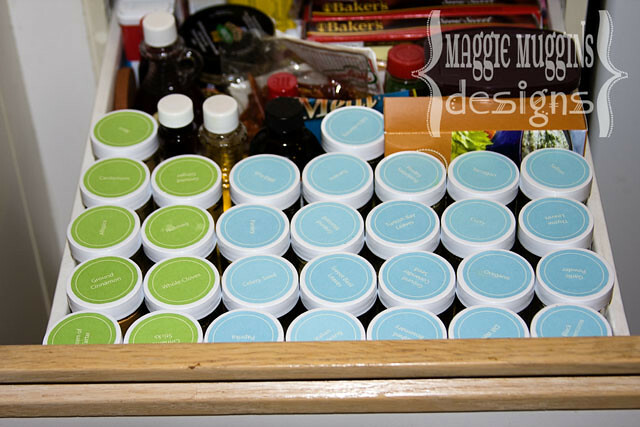 So finally, I decided to make room in my practically non-existent drawers for a spice drawer. I love it! 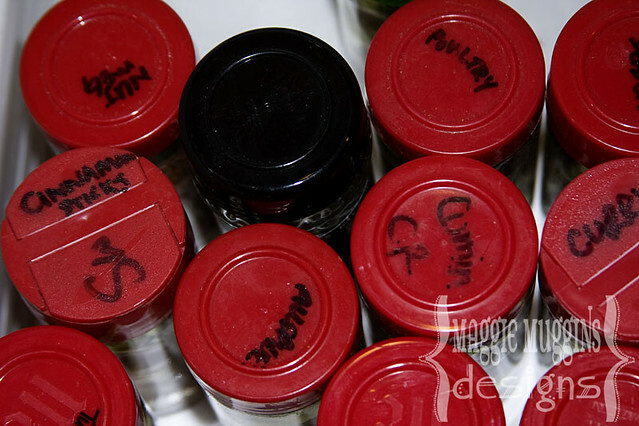 The two draw-backs are that there are so many different spice bottles and heights and the spices with black lids. I used a Sharpie to mark the names on the lids, but it didn't show well. So for Christmas my awesome in-laws gave me new spice jars . I briefly considered these jars . They are cute, but not as practical for the drawer. I meant to cut them on my Silhouette but the computer was having problems so I cut them by hand. It really wasn't that hard. They turned out looking fabulous! I even organized the spices by color. All the sweet (baking) spices are green and all the savory (cooking) spices are blue. Love it! 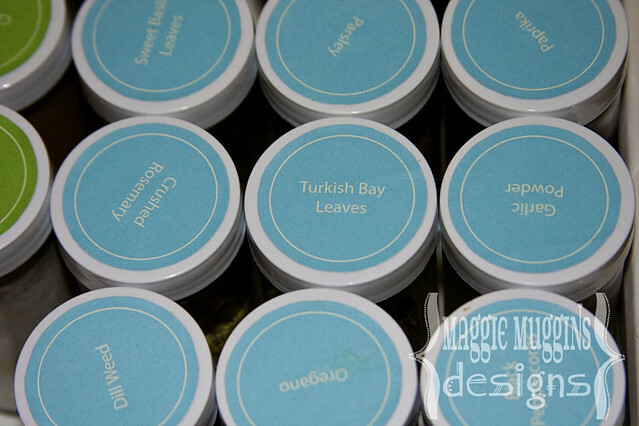 I even ordered an extra box jars so I could have all my spices look this awesome! I'm thinking about coating the labels with Mod Podge or something else to prevent damage. My husband has been planning for a while to reinstall everything on the computer. As in a complete technology make-over. Last weekend he got started, and unintentionally made it impossible for me to dual boot to my old set-up. Luckily the data is still intact, but it's been slow for me to set it up again. I just barely got Photoshop back up today. You can look forward to more creative posts here! We have been so extremely busy. You see two weekends ago we got this idea in our head to look at some new houses in the area. We seriously considered buying one. My husband likes to joke that Heavenly Father "mumbled" something to me which I didn't completely understand and we stopped short of buying a home. What really happened was a strong feeling that this wasn't the right thing to do, along with a snippet of a message that, while it was clear, I didn't fully understand. I do now. We are not moving (yet) but we are saving and keeping a close eye on the market. I'm glad to have someone who knows so much more than me there to guide me along on the huge decisions. I will confess though that I'm sad that the house wasn't right for us. My dream of having my very own craft room felt so real for one brief moment. In the mean-time we've decided to rearrange things to fit in our place still. So over the last week we've donated, sold, given-away and moved things around. I'm not done but things are slowly coming together. The best part is the master bedroom closet has officially become my sewing room (shared of course with some clothes and other storage). Hopefully soon I can walk into my bedroom and not feel like my crafts have taken over! Hurray! I told you I started couponing a while back. I remember listening to other women chat about all the great deals, and all the free stuff they got and how everyone should coupon. As I listened I was always dubious as to whether or not it would really save me money - especially when I knew that 20 boxes of tuna helper would never make it to my pantry - let alone into my mouth - no matter what the price! Limit my couponing to two stores. No buying anything that I wouldn't have bought before. Even if it was a really good deal. Subscribe to several couponing blogs (mostly ones that share the weekly deals). Start saving the paper coupons that I get. Start printing some coupons (NOT all) that I knew I would for sure use. I still have not subscribed for a Sunday Paper in order to get coupons, but I may consider it later. Right now what I am doing is enough. I still save a significant amount of money and that makes me happy enough. One of the best parts is that couponing blogs are not limited to coupons for food. They share all sorts of coupons and other great deals. While I have saved money on food and other items from my local pharmacy, the other savings have been above and beyond that. The other day, thanks to a Heads Up on one of the blogs I read, I heard about a sale on Toys at Target. I thought it would be great to get ready for some of the Birthdays coming up, and found some other good deals that I couldn't resist. Yes, I'm already thinking about Christmas this year. Had I paid full price it would have cost me $254.64 at Target! On Amazon it would currently cost me $250.74 (and that is with free 2 day shipping on some items)! So that's a total savings of $187.08! Is that evidence enough that couponing (and reading couponing blogs) is worth it? I won't continue on about other awesome deals I've found, (like other deals on toys, or a ton of pharmacy items that the store paid me to buy) but I will say this, it's definitely worth the money saved!